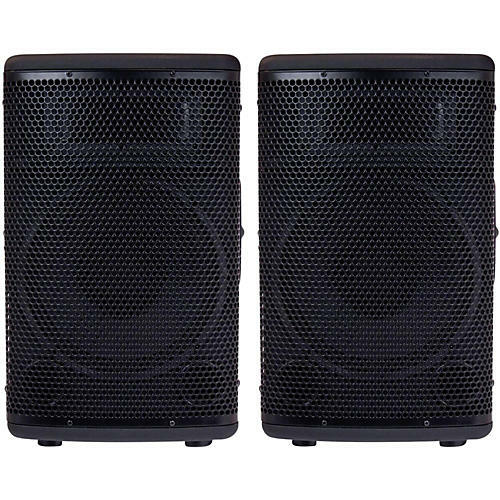 A pair of 10" powered speakers at a working musician's price. The Kustom KPX110P powered speaker cabinet packs a lot of value into a compact, affordable package. This full-range cabinet offers fantastic audio quality. A specially voiced crossover maintains clear separation of frequencies for crisp, detailed sound reproduction. The cabinet's 10" woofer delivers punchy low frequencies, while the horn reproduces all the clear high tones. The KPX110P is equipped with two Balanced parallel input jacks (one XLR and one 1/4") that accommodate line-level devices (not microphones) as well as a Balanced Line Out (1/4), which allows additional Powered cabinets to be connected. The KPX series has been designed to withstand years of active duty with sturdy metal grilles, stout handles, and a high-quality, heavy-duty finish. The cabs also offer a 1-3/8" pole mount insert. Ideal for stage, house of worship, DJs and more. Order your pair today! Dimensions (HxWxD): 474 cm x 310 cm x 299 cm, 18.66" x 12.2" x 11.77"
Weight: 11 kg, 24.3 lb.